Name: Paris III - Modern Bathroom Vanity Set 32"
The Paris III modern bathroom vanity set offers sheer classical elegance and Victorian charm. 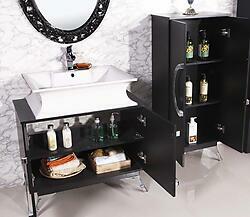 Additional matching storage cabinets may be purchased for this modern bathroom vanity set. 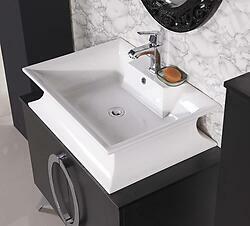 Look no further for your modern bathroom vanity, Paris III has it all! This luxurious modern bathroom vanity design adorns the solid wood cabinet with a pair of circular metal handles on the cabinet doors. The 2-Door Euro design cabinet with contemporary and elegant Parisian character was incorporated to provide plenty of flexible storage. A sophisticated pattern outlines the custom cut oval mirror for this modern bathroom vanity set and is included to extend the impressive quality and design of this unique set.